Product #32143 | SKU 61805 | 0.0 (no ratings yet) Thanks for your rating! 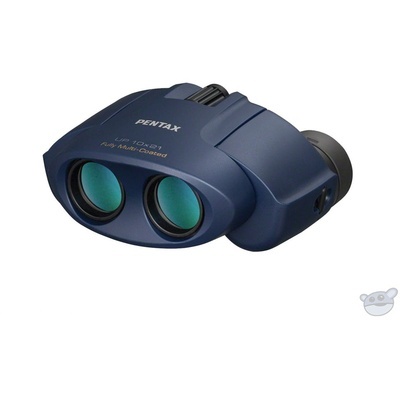 The compact and lightweight navy 10x21 U-Series UP Binocular combines aspherical optical elements and BAK4 Porro prisms to deliver edge-to-edge image sharpness with a 50° angle of view. The optical elements are also fully multicoated to provide a high transmission of light. With an 10x magnification and 21mm objectives, you obtain a higher than average magnification and a compact form factor. You can easily spot your targets with a wide 5° angular field of view and quickly bring them into focus with a centre focus wheel. In addition to observing distant scenes, birds and game, the minimum focus of 9.2' allows you to study in detail close objects like animal footprints, marks or landscape features. The binocular also features a 2.1mm exit pupil, a 9.5mm eye relief, an interpupillary and a dioptre adjustments. The binocular is very compact, lightweight, and features a single piece frame that houses objectives, which allows for a synchronised interpupillary adjustment. To accommodate eye glasses wearers, the binocular offers sliding rubber eyecups. Also included are a carrying case, a neck strap, and eyepiece covers.